today is the best day of the year. for me it even beats christmas. it really should be a national holiday. today is opening day. it's spring and it's time to get the baseball bats out again. i planned my whole day around the first pitch of the season, which was just after 11:00 a.m. mountain time. the yankees hosted the tigers to start things off. jake even planed hooky to watch the game with me. it was fun to have him around. the yankees recorded a win, so i'm convinced they're going to go 162-0! play ball! i was in a cleaning zone this morning, so that's good. it probably won't last. i took the dogs for a nice walk today. jeter loved it. he pranced around smelling everything, chasing birds, barked at other dogs, enjoyed the outdoors. romeo spent the whole time looking over his shoulder to see what was coming to get him. that's pretty much their personalities to a "t". then the afternoon was devoted to hooky. caroline skipped out of school. we went to target to get her some spring items. then we drove through in-n-out (yummy). after that, caroline had a dermatologist appointment because she is dissatisfied with a little mole on her face. we tried to talk her out of having it removed, and we won for the time being. it was fun today to watch the student body officer candidate skits. there are 12 kids left in the election. they were divided into two groups of six and then each group did a skit. jake's group went first. they did a silly competition, answering questions and spelling words. jake was kind of a dumb jock. his friend kelsey (in the blue) was a total nerd. she was really funny. of their group, jake and kelsey got the biggest cheers. hopefully that means they will get the most votes. david hulet spends a lot of time at our house (almost as much as thomas did). he was in the other skit group. they did a play on the game clue and david was mrs. white. he was hy-ster-i-cal! he also got a lot of cheers. now we're sitting on pins and needles for three more whole days waiting to hear the results. good luck jake! i wish i could say that something exciting happened at our house today. but nothing did. sam had baseball practice. isaac had nothing. craig and caroline went to the play "a tale of two cities" at hale centre theatre. jake practiced his election skit for horus and hours. why did it take that long? i often wonder why things take jake so long. but i don't have an answer. his end product is usually worth waiting for though. i was happy that i stole a minute by myself to walk around pottery barn--a favorite activity. and that's all she wrote. i saw these cute easter bags on a blog and decided to make some of my own. they turned out darling if i do say so myself. i ended up with 12, so all the little davis girl cousins are getting one to put all their easter loot in. can't wait to deliver them. caroline and i went to the yw general broadcast tonight. i enjoyed it very much, especially president eyring's talk. elder holland is still my favorite and i have bad dreams that one day i will give a talk in our ward and president eyring will be on the stand and i will say in my talk that elder holland is my favorite. actually though, i don't think president eyring would care. what a blessing it has been to be in his ward. i'm so grateful that we were gathered here to this ward and stake. my kids are really going to miss president eyring when they all leave here. sam came home from the freezing cold scout campout, took a hot shower and crashed on the couch. i wonder if the leaders crashed too. it was cold and it sounds like they didn't get a lot of sleep. craig was nice enough to finish painting my sewing room. it looks fabulous. sam and caroline ran errands with me, i suspect in hopes that i would buy them something. the hardest part about today was watching elite eight games. without byu. ...apparently we don't have one. scout campout tonight at crystal hot springs was fa-reezing. doesn't sam look cold? he woke up at 6:00 a.m. and said he practically had to sit on the fire to warm up. i thought i had done my motherly duties and sent him with the right equipment, but he was a wee bit cold. craig is off today to buy us a few warm type sleeping bags. we had fun tonight meeting some old friends at market street broiler for dinner. craig smith has been a friend and tennis partner of craig's for many years. 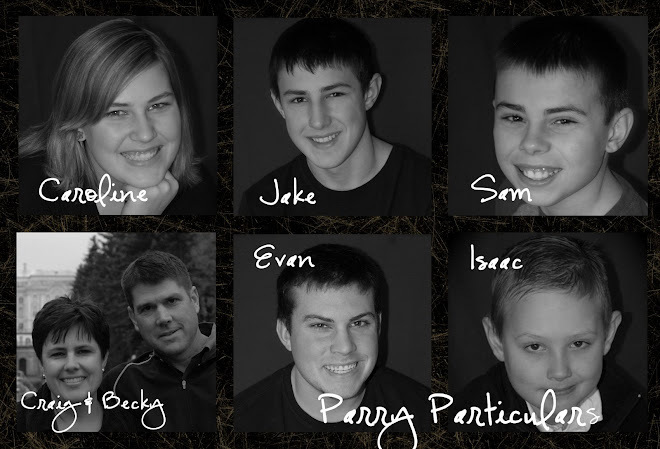 the smiths live in pleasant grove and our kids are all about the same age. it was fun to catch up. we asked them what was new and got the simple, boring answer, "well, craig donated his kidney last year". hmmm, not your average run-of-the-mill answer. i am sick to death of snow. we got a foot today. yes, a foot. it's almost april and snow is still covering the ground here on the east bench of bountiful. it's hard to play basball in the snow. sad day today. after running on fumes and making it into the sweet sixteen, the cougars finally ran out of gas and lost in overtime to the florida gators. i really thought we had it. so, we're sad. it was an extraordinary season and so much fun to watch, which makes it all that much harder when it ends. i can't even get sam to speak. hopefully something will brighten his day tomorrow. what a great year to be a cougar fan! still enjoying my book of mormon classes on wednesdays. a real highlight of the week. today we talked about enos. there's so much there if you read between the lines. i'm worried that the jimmer train may screench to a stop tomorrow. i think we will win. i have thought florida to be overrated all along. but i fear that the fun of jimmermania will come to an end. that will be a sad moment. sure, we will be able to look back and know we had a great season and that we truly overcame adversity (not like all those other teams giving post game interviews saying that they overcame adversity). we will remember how much fun it has been to watch to jimmer, to go to the games at the marriott center, to plan saturdays around tv games. it's been a fun ride. here's hoping for a few more wins before we have to hang it up. craig took caroline to fencing tonight and i took isaac to "airborne", a warehouse full of trampolines (and kids). his baseball team had a detox party. i took my ipad, found a soft leather couch in the corner and finished my book. sam had scouts and jake had a service project--cleaning the granary in kaysville. so a good time was had by all. i forgot to say that i was released from the primary presidency on sunday. not excited about that. i came on board late when someone in the presidency moved, so i feel like i haven't been there long enough. i was only given that call in the fall. before that i was in young women's for a short time and then scouts for a short time. i'm a short-timer i guess. in our church, we're never long without a job, so i wonder what's around the corner. today i played the piano for jake and david to try out for the senior choir. i hope they aren't penalized for their accompianist. the singing was great, piano playing better than mediocre. grades for the third term were finalized today. sam had a few late things to hand in because we were gone last week. jake, caroline and sam brought home 18 As and 1 A-. so, not bad i'd say. we were lucky enough to get our first letter from the mission field from elder hamilton. he sounds so happy and says he's working really hard. he has been assigned to mobile, alabama, but his companion is from right here in davis county (wxhs). it's so good to hear from him! today was a day off school for teachers to get their grades in. caroline and jake pulled off 4.0s again this term--not without a lot of hard work. sam was almost there and then he missed the last two days of the term last week and with missing work in algebra that brought him down a tiny bit. i'm pretty proud of all three of them. we got in from st. george late saturday night (sunday morning at 2:00 a.m.). as luck would have it, craig had to turn around today and head back to st. george for a court hearing tomorrow. he does get to fly though, which makes it a little more enjoyable. a happy thing happened today. i made crock pot chili because i was going to go to sam's baseball games in ogden tonight and i wanted to leave a hot dinner. i mised up all the ingredients and thought it was just an ordinary looking pot--i wasn't even that excited about the recipe i had used. later in the afternoon, jake came up and showed me some fun things he got at the valley forge souenier swop. some of the kids who went to the conference were from ohio and they swopped cincinnati chili seasoning packets. cincinnati chili is my very favorite and i had just had some when we went to a reds game in phoenix a few weeks ago. so i told jake to dump it right in the crock pot. it was a huge hit! i had a short-lived dream today to go to new orleans to see the jimmer and co. play their sweet sixteen game. spent a little time looking for flights, but they were too pricey, so i guess i'm ready to let that go. we'll hae a fun time watching here together on tv. go cougs! tonight was our annual fantasy draft. it's a scary thing. matt and ryan and g-dawg drafted at their own homes. here we had sam, jake, me, isaac and craig (who was on the phone with evan) each on a laptop. it's always intense to say the least. i had the first pick and took albert pujols. i took a calculated risk that my favorite player, joe mauer, would be available in the third round. he wasn't. this made me angry and i was angrier still when jake took my next choice for catcher, buster posey, one pick before me. sam was mad because i took two angels players that he wanted to draft, but he let them fall too far. jake is pretty happy. craig is happy. isaac likes his team but he's worried that i feel bad so he's trying to trade for mauer so he can trade mauer to me. he has a good heart. there was only one swear word uttered and only one item thrown, so i consider that a good draft day. waking up saturday morning, we were a little hungover from all that baseball and still sad that we didn't make championship play. we couldn't decide what to do and the boys weren't really ready to head back yet, so we decided to spend the day in st. george. we watched some basketball, went to old navy, had lunch at pizza factory express again and i took isaac swimming at sand hollow. then we watched the byu game against gonzaga, which we won convincingly. after the game at around 8:00, we headed home in the dark. we got in very late, but it was a fun trip. i love spending time watching the boys play baseball and craig is a fabulous coach! we had later games today, so in the morning the boys went to fiesta fun and miniature golfed, we ate at the pizza family express, then headed out. isaac's games were in tonaquint (the absolute middle of nowhere, 40 minutes north of st. george. you know you're playing in a small town when there are signs in town saying "welcome rocky mountain baseball players". isaac's team put up a lot of runs early in their first game, but the other team started to come back. they put isaac into pitch in a touch spot and he was "lights out", getting 6 of the next 7 batters out and getting us out of the game with a win. he caught the first few innings and threw out the first two baserunners at second on steals. the other team didn't steal again the rest of the game and i kept thinking "the catcher's got a gun". he was the hero of that game, also hitting well. then we promptly lost our second game. sam's team played in washington city. they won their first game against a not very good team and then played the irish to finish the tournament. we were ahead 4-2 until the late innings when the irish came back and scored 3, which we couldn't match, so we lost 5-4. the kids and coaches were very sad because had we won this game, we would have gone to the championship bracked and played on saturday in the play-offs. it was a heartbreaker. every year during ncaa march madness, we attend a baseball tournament in st. george called "march madness". i love it. it's just starting to be spring and it's usually warm enough for sandals in st. george. and the best part is, baseball is back! today was the first day of the tournament. isaac played games in hurricane (not my favorite fields). his games were early. he started the first game pitching, but because of a portable mound problem he struggled and they moved him to catcher. he had two fun games and hit well, but his team lost both. when isaac's games ended, we quickly jumped in the car and headed for mesquite, nevada for sam's games. sam played great in center field, stopping runners from scoring from third a couple of times because of his great arm. he also had an amazing double over the center fielder's head. the blackhawks won the first game and barely lost the second game by two runs. in fact, they had momentum and we thought we could play one more inning but the time expired when our inning ran 10 seconds too long. it was a big, big bummer. after all four games, we went back to the condo and watched the recorded byu ncaa tournament game with the brinkerhoffs. they had won earlier in the day and won again when we watched the recording! yes, we are "on the road again", a phrase made famous by the timeless willie nelson. this is significant for two reasons: we are actually on the road again today, heading to st. george to play baseball (yay!). also significant because isaac, sam and i are being held captive in the car with craig driving and he is playing exclusively country music. we are being held against our will. stopping for dinner in lehi was an event. i wanted in-n-out burger. there is never a time that i do not want in-n-out burger, which is funny because i'm not that much of a burger gal, but there's something about the burgers at in-n-out. they are delish! in the same parking lot as in-n-out is costa vida. sam never passes up a chance to eat at costa vida. isaac didn't want to eat at either place, so craig took him to zumba's (a soup and sandwich type place), also in the same parking lot. so we divided and conquered. craig told me to get him a burger, but when he went to zumba's, he saw something he wanted more, so he had two dinners. it was confusing, but we all converged on in-n-out and enjoyed our various delicacies. i'm just glad all seven of us weren't there. well, i heard thomas headed off to tallahassee today. he didn't call me fromt he airport, which made me kind of sad, but he did get to call and talk to evan for a few minutes. i'm hoping to hear soon that he arrived safely. 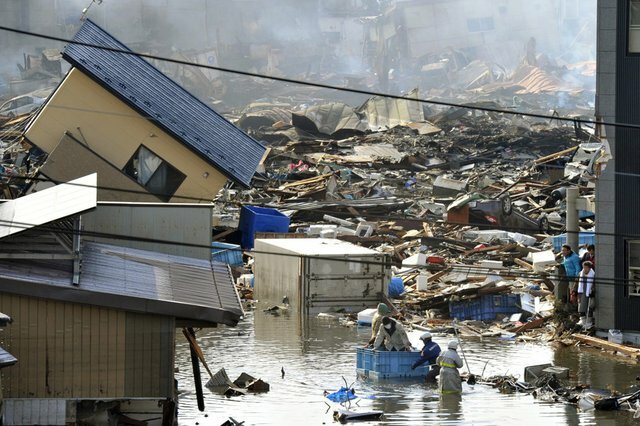 the japan tsunami and earthquake are still dominating the news. a nuclear power plant in the quake zone was badly damaged and is now emitting high levels of radiation, so today elder holland announced that the church was moving all sendai missionaries and some tokyo missionaries out of the radiation zone. he said that we were moving missionaries three times the distance recommended by the japanese government. i just keep thinking what an adventure these missionaries have had over the past week. i assume that nagoya will absorb many of the sendai missionaries and wonder what the future holds for all missionaries now in japan and those assignmed to go to japan (evan!). other than that, regular day around here. lots of studying after school. baseball practice. track practice. violin lesson. we're heading for st. george tomorrow for another baseball tournament. can't wait to be warm and watch a little ball. now that we've had to buy cars for our teenagers to drive (it's well worth the money for me since they can drive themselves around and occasionally help me with driving), we haven't gotten new cars for ourselves quite as often. yesterday craig's car turned over to 100,000. but i dont' want him to get a new car because i want to get one first. after all these years of driving a big ol' suburban, i want to drive something smaller. it's going to be rare that all seven of us are in a car together now. all our cars still look pretty good, so we should probably all just drive the cars we have. so, craig's birthday yesterday, evan's today. we did the church thing then enjoyed watching our newest cousin, Sullivan Monroe Davis (i thought his mom would appreciate capital letters for sully), blessed. we had a wonderful feast at grandma's, including another cake for craig and evan. and in the words of my sister-in-law, celeste, "day of rest, my eye"! today was craig's birthday. today wasn't really about him though. i hope that was okay, usually he doesn't care if anything is about him. we did get him a cake (that he shared with evan), we went out to dinner at salt city burger (yum-o), we watched byu lose to sdsu (they were supposed to win as part of the big birthday celebration, but san diego didn't get the memo), we showered him with gifts (a japanese nativity, books, etc.) and he participated in the mueller park draft where with some help with his other coach they were able to stack their team so we probably won't lose one game this season. so a pretty good birthday! oh ya, there was that little thing about going through the temple with evan too. we had a wonderful time at the temple. stacey had to stay home with sulley and most of craig's siblings live out of state so we missed them, but there was still a lot of support for evan. he also brought his friend, troy barton, home from byu for the weekend. we were glad to have him along. troy is going to mendoza, argentina on his mission, he leaves in may. yesterday was a horrible day for the people of japan and families of missionaries in japan. an 8.9 magnitude earthquake was recorded near the city of sendai just north of tokyo, japan. with that have come many, many aftershocks. it took a full 24 hours and then some to account for the 80 missionaries in the sendai mission, but finally the last two, who had to walk some distance to find a shelter with communications, checked in. the area around sendai is really devastated by fire, tsunami, and earthquake. it is a very sad situation and i'm so sad for these people that i now have another bond with. the news coverage of the disaster consumed my whole day as image after image was shown on tv. of course, i'm worried about sending evan to this land of many earthquakes. jake is in philadelphia having a grand time. he is at a leadership conference taking place on the actual grounds of valley forge. they got to debate parts of the constitution, ask questions of a thomas jefferson impersonator, meet the philly phanatic (and his two world series rings), and really just have a great time. his roommate is from nebraska. we miss him though. tonight we watched the mountain west conference semi-final game between new mexico and byu. nmu had already beaten us twice this year (2 of our 3 losses), so we were raring to go. jimmer had an other-worldly performance, scoring 33 points IN THE FIRST HALF. he went on to finish the game with 52, only one point coming on free throw shooting. i think he could have closed his eyes and shot the ball and it still would have gone in. he was amazing. we advanced to the finals tomorrow night against san diego state--a team we have beaten twice this year already, but they are very, very good. jake likes to have fun and people like to be around him because he likes to organize fun. he started a tradition last year of skiing to school once during the winter. he left it for the end of winter this year, but this week when we had our big snowstorm, he decided it was time to fit it in. he and his friend seljaas ventured out and our friend and neighbor katelyn brown decided to join in. i'm so grateful that cindy was smart enough to send someone out with a camera to snap this picture. they had a great time. people rolled down their windows and asked them what they were doing to which jake responded, "my mom ran out of gas" and "you know gas is expensive these days". cheeky boy. glad to have the fun memory. yay! byu won today to advance to the mwc semi-finals. it wasn't pretty and i'm worried for tomorrow's game against nmu, but we did get it done. sam and isaac both had games tonight. it was sam's tournament and they lost, so we can officially move onto baseball season for him. isaac's team won (they always win) and they are really fun to watch. because of isaac's size, he gets almost all the rebounds. he has two more games, but we will be out of town for both, so we wish his team well without us. wednesday is always a busy day for me. we usually have our primary presidency meeting wednesday mornings at 9 and then i quickly head off for my weekly book of mormon class that starts at 10. the class is held at my mom's church in bountiful and is taught by diane hallstrom. her husband is a member of the seventy. she's amazing and knows everything about the book of mormon. i'm amazed every single week at the things she brings out of the pages of the book and how she has taught us an appreciation for what it teaches us. it is slow going, we started meeting in september and have made it to jacob 5. so, we'll take the summer off and start up again in the fall until we work our way through. doug and linda took craig and me to dinner last night to celebrate craig's birthday, which is saturday. we had a nice time visiting at a small, warm italian restaurant on 1500 east. it was fun to catch up with them because we don't get to see them very much. unfortunately while we were gone, jake fell asleep and slept for 2 1/2 hours, which isn't good when you are as busy as jake. so he was up late finishing school work that needed to be turned in today before he left for valley forge. caroline had young women, where she is learning to tie a quilt. i must say, that is not her favorite thing to do. sam had a board of review, where he was advanced to a "life" scout, which means he can get his eagle in september! that we be a new record for our family. isaac is trying to catch up in school from being gone last week, but he still had time to fit in a long bath and also american idol. i think we can all agree that the snow is beautiful. especially when the sun is shining and the snow glistens and it's so white you need sunglasses. it's pretty. it's spectacular. but, it's march 8. and i just spent a weekend--a beautiful weekend in phoenix watching baseball! so, i personally hope the snow will move on. today was boring and mundane. lots of loads of wash and that was without even going into the downstairs washroom. i cleaned. i drove caroline to violin and sam to the orthodontist. craig drove caroline to fencing and we each drove isaac one way to baseball. the salt lake tribune called and asked if they could interview us for a story they are doing on parenting styles. apparently ours is the "stopwatch" parent, which means our kids are on pretty tight schedules. the reporter promised that this isn't a negative thing. we'll see i guess. he's coming thursday. and i have a little fight brewing with ihc. isaac takes a cocktail of medicine every day to stay alive, one of his pills being allegra. allegra has just gone over-the-counter, which is great, but he frequently takes the fastmelt variety. he uses the fastmelt when he has eaten something that is bothering him and he needs to get the medicine into his system fast. they aren't going to cover the fastmelt either, even though there is no over-the-counter substitute. it is annoying me greatly that i have to spend my time and dr. broadbent's time fighting them. i'm up to the fight though. we're all home now. it took isaac and craig 6 1/2 hours to drive home from st. george because they hit a major snow storm on the way. that snow storm has now dumped six inches in our front and it's still coming down strong. boo. we went from a beautiful day yesterday to a really cold and wintry day today. kinda makes you not that happy to be home. romeo and jeter were happy to see us though. i'm going to go ahead and admit right here that we made a really bad choice on sunday. rather than go to church, we went to the rangers/brewers game. and we were rewarded with the most beautiful day i think i've ever seen. the temperature was perfect and it was the greatest day for baseball. we had great seats. we got to see josh hamilton hit a single, double and a triple. we got to see super star zach grienke pitch. we saw prince fielder, ian kinsler, michael young. it may have been one of my favorite games ever. we didn't make it to a major league game today, but we watched sam play three games. craig said coaching third base for six hours was way too long. sam got out of his mini-slump after hitting a double and then going on to get more hits including two bunt hits, one an rbi single and the other a suicide squeeze, one of the hardest hitting feats in baseball. with a runner on third, the batter bunts while the guy on third goes. he is usually two or three steps from home when the bunt happens. the reason it is called a suicide squeeze is because if the batter doesn't pull off a good bunt, he's hanging the baserunner out to dry and he usually gets out. we never take enough pictures of craig so we took some candids of him coaching. look at the air he gets on that last one. and in one he looks like he's really telling someone to slide. i hope they were safe. we were so busy with sam's games on saturday, we didn't make it to an mlb game. we did meet our friend, keith johnson, for dinner saturday night at the cheesecake factory. keith was just promoted to be the manager for the angels aaa organization in salt lake. we had a lot of fun talking about baseball with him. we started our morning early with another game at big league dreams ballpark. sam's team struggled again, but it's still always fun to watch them. it was really fun to have evan with us for the weekend. he coached first base once for craig, but he got someone picked off, we we fired him. after the angels game, we went for mexican food and then went to the giants/dodgers game. traffic was horrible and we didn't care much for the crowd, so we left early. but we did get to see last year's nl rookie of the year, buster posey, hit a homerun. sam played some baseball this morning. it wasn't the two best games i've seen the blackhawks play, but i suppose they had fun. sam did pitch well. and this is bobby abreau. he is an outfielder for the angels. i think he ate too many sopapillas in the offseason. he's jolly though. later that night we went to the dodgers/reds game. it was a beautiful night and not very crowded, so we really enjoyed the game. spring has sprung, at least in phoenix it has. spring in phoenix means baseball players are back in town﻿. it's also means beautiful weather. isaac and craig headed down to phoenix a day ahead of the rest of us. they were lucky enough to go to a diamondbacks/giants game wednesday night. it was there first game of the season, a little cold, but not too bad. isaac started off his very lucky weekend meeting tim lincecum, the san francisco giants ace pitcher who won two games in last year's world series. many people call him "the freak" because of his pitching style and his long, kind of stringy hair. he's really young and just kind of quirky. i don't know that i was a big fan before, but i sure think he's great now. wednesday night at the game, he signed a ball for isaac and also a ticket for sam (who wasn't at the game). he also posed for this picture with isaac. so, we have been pretty involved in and excited about byu basketball this year (as you can probably tell). this has been an unprecedented season and it has been a lot of fun. we have never been to so many games at the marriott center. but, as life does, we were dealt a death blow last night when our starting forward was suspended for the remainder of the season for honor code violations. we still have jimmer, but it's going to be harder to win and they have been talking about that all day on every news program. we went from almost being a lock on the #1 west seed to not. it's just basketball, so it shouldn't be that important, but it takes the wind right out of our sails. i'm bitterly disappointed, as are thousands of other cougar fans. evan has been sleeping out at the marriott center with some of his friends since monday. i'm sure they are having the time of their lives. i just hope they are doing homework. seeing drew working on a laptop is a positive sign. i've learned that often when things become bigger than life and we become so consumed with them, heavenly father has a way of bringing us back around to what is important. maybe this is the case here. maybe we were all too wrapped up in the jimmer and going to the final four. craig and isaac are on their way to phoenix. sam and i are flying down tonight and evan tomorrow. can't wait to be warm!